PFL 4 from the Nassau Colosseum in Long Island, NY. Lance Palmer after his Main event victory. (Business Wire). Lance Palmer, former Four-time NCAA All-American wrestler out of Ohio State dipped into his wrestling roots Thursday night at PFL 4 to secure a dominating victory. Palmer battled Juma Tuerxun of China for nearly a full nine minutes. PFL 4 (Professional Fighter League) aired on Facebook Live at 6:10P ET followed airing live on NBC Sports Network at 9 PM. 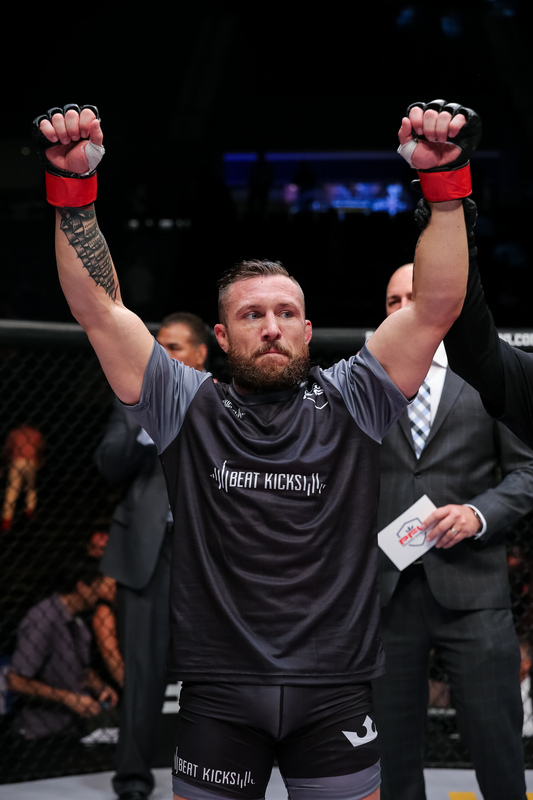 In the second round of the PFL regular-season, Palmer bullied his way to a submission victory in the main event on Long Island at the NYCB Live Nassau Coliseum. Each of Palmer’s two Submission victories inside the PFL cage was set up by his flawless takedowns. The Columbus, Ohio native, now a member of Xtreme Couture MMA in Las Vegas, and 10th Planet BJJ, feels his striking and grappling skills have improved drastically in the short time since the move. He is formally a team member of Team Alpha Male in California and now since his switch, feels he’s growing again as a fighter. In his first bout at PFL 1, Palmer scored a second-round Submission Rear Naked Choke which earned him five bonus points. Thursday night on Long Island, Palmer went nearly a full nine minutes grinding out Tuerxun before the Ohio native held the back mount and submitted his Chinese foe. The known grappler landed 77 strikes compared to his Chinese counter part’s zero, on Thursday night at PFL 4. Palmer, 30 has a victory over the number one seed in the playoffs, Steven Siler. The number 3 seed Andre Harrison defeated Palmer via unanimous decision at World Series of Fighting 35, where he lost the belt to the Long Islander. Since that fight, Palmer’s hands have improved and his wrestling game remains top of the division. Palmer and Harrison may not run into each other as early as everyone predicted. It could possibly be another championship showdown between Palmer and Harrison. In the post-fight media scrum, the former Ohio State Buckeye mentioned he plans to visit their wrestling room while he’s home in Columbus. The Ohio State Buckeyes have several of the top wrestlers in NCAA wrestling and the world. Many former wrestlers return to their former schools to hone their wrestling skills. The All-American is among the top two fighters in the PFL featherweight playoffs to win the million dollar grand prize on December 31, 2018. In order to win the championship and prize money, he’ll have to win three fights to take home the check. 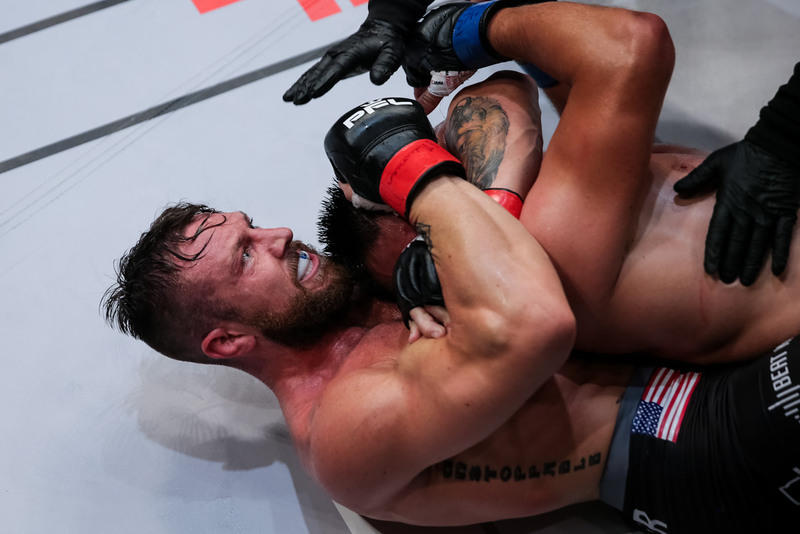 Seeding is completed, Palmer’s second-round Rear Naked Choke submission in his first PFL bout earned him five bonus points and a determined late third round Neck Crank submission earned him four bonus points, giving him the No. 2 overall seed in the playoffs. PFL 5 returns to Long Island on August 2, 2018, at the NYCB Live Nassau Coliseum. The undercard will be aired on Facebook Watch followed by NBC Sports Network live broadcast at 9 PM. The Playoffs begin in October and culminate on New Years Eve at Madison Square Garden in New York City, NY.